Melt butter in a small sauce pan and combine with erythritol. Keep on low heat until erythritol is dissolved. In a mixing bowl, combine butter and erythritol with cocoa powder, vanilla and salt. Add in an egg and mix until well combined. Add your food coloring and apple cider vinegar. Add 6 tablespoons (or 1/4 cup and 2 tbsp) of sifted almond flour and mix until fully combined. Pour the mixture evenly among 4 greased ramekins and tap on a hard surface to flatten the batter out and remove any air bubbles. 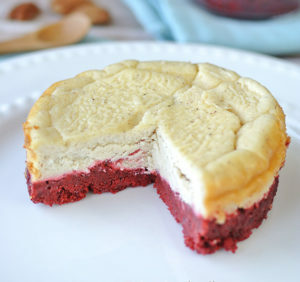 Place them on a cookie sheet and into the refrigerator while you make the cheesecake layer. We used 3 ramekins and 2 small mason jars to show the layers. Using an electric hand mixer, beat the softened cream cheese and butter together until light and fluffy. Add in an egg, vanilla extract and cinnamon beat again. If you don't have powdered erythritol, simply place 2 tablespoons in a Nutribullet and blend for a few seconds. Powdered in seconds! Add in 2 tablespoons of the now powdered erythritol and a pinch of salt and mix with the hand mixer one last time. Take the ramekins out of the fridge and spoon about 2 heaping teaspoons onto each red velvet layer. They should not mix, but should definitely meet without any gaps between them. Use the spoon to gently push the cheesecake layer to the edges of the ramekins. There should be no gaps between the ramekins and the cakes. Tap the ramekins again on a hard surface so that the top layer flattens out. Bake in the oven for about 20 minutes. Check to see if the tops are set but still slightly jiggly- that means they're done! When they're done, let them cool a little. You have the choice of digging in right away when they're warm or chilling them for a few hours. The textures differ greatly warm or cold. When chilled, they cake become more dense as they deflate a little.